Despite playing on the top line with excellent goal-scoring wingers, Bozak has produced like a second-line centre at best. His numbers look even worse when you account for the obscene amount of minutes he's given. Over the last two years at even strength, Bozak is 217th out of 282 forwards in points per 60 minutes. World beaters like Chad Larose and Ryan Jones are out-producing Bozak on a per-minute basis. Plus, Bozak's production is almost entirely dependent on Kessel, although the chemistry doesn't translate both ways as Bozak has much less influence on Kessel's production. Cam Charron puts it more bluntly, saying, "There's no chemistry there. If anything, there is biology, in the respect that Bozak is in a parasitic relationship with Kessel." What Bozak does well is win faceoffs. Unfortunately for him, the importance of faceoffs is overrated, and the difference between Bozak winning 52.6% of his draws and Mikhail Grabovksi winning 50.6% is negligible. If both players took the same amount of faceoffs last season, Bozak would have won a grand total of 13 more draws than Grabovski. Nazem Kadri's emergence this season has made Bozak completely expendable. In half a season Kadri nearly scored more points (44) than Bozak's career high of 47 set over 73 games in 2011-12. And that was playing third line minutes without the luxury of an elite goal-scoring winger like Kessel. Even with the inevitable regression coming to Kadri's own inflated shooting percentage and that of his linemates, an increase in ice time and better linemates should ensure Kadri's offensive production doesn't decrease dramatically. When Bozak was injured and missed time at the end of the season and the last few games of the playoffs, Kadri stepped onto the number one line and didn't look out of place. Kadri's development should also make the pursuit for an outside option less necessary, as the Leafs can now stick firm to a cheap offer (e.g., 1-2 years, $3-4 million a season) for a free agent like Stephen Weiss, rather than trying to match any potential inflated market price out of desperation. The same theory holds true for the trade market. If the Leafs are unable to land someone like Paul Stastny for a song, heading into training camp with Kadri penciled in between Kessel and Joffrey Lupul/James van Riemsdyk isn't a bad option, allowing Dave Nonis is spend assets on an area of greater need. What to do with the third line? Moving Kadri up to the first line would leave a hole on the third line, the spot fans have argued Bozak is better suited for anyways. 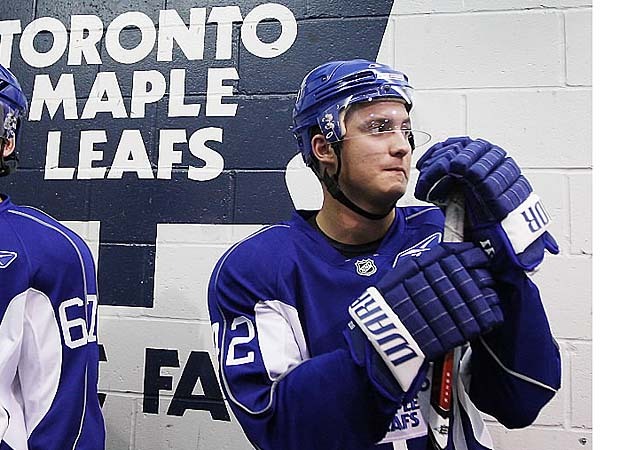 But with Bozak looking for first-line centre money this summer, he will prove too costly to fill such a need. Thankfully, the Leafs have an internal candidate that could step onto the third line. Joe Colborne, after a tumultuous 2011-12 season and a slow start to this season, came alive for the Marlies with 27 points in 34 games after the NHL lockout ended. And after a late-season call-up, he acquitted himself well with the Leafs, playing in games 6 and 7 of the playoffs and looking like he belonged. The 23-year-old, slow-blooming centre provides size in the bottom six, although he has been often criticised for lacking the physicality typically wanted from a big man. Colborne wouldn't be needed in a defensive role, however, meaning his lack of physicality wouldn't be huge detriment. The Leafs could use Colborne in a similar role as they did Kadri early in the season, putting him on a soft minutes line, easing him into the NHL. Colborne would be matched up against weaker competition, usually second or third-pairing defencemen, and get the benefit of more offensive zone starts. That treatment worked amazingly for Kadri, and although expectations for Colborne should be substantially lower, putting him in a similar role could help him make the leap to the NHL. To guard against the possibility that Colborne proves unable to crack the roster, the Leafs would need to find another bottom-six centre. The perfect solution is Boyd Gordon, a capable defensive player who played well against tough competition last year. Then, if Colborne can't handle his chance with the Leafs, McClement can move from fourth line winger to third line centre, spreading out the defensive forwards and freeing Grabovski for more offensive minutes. If Colborne is able to make the leap to the NHL, a combination of Gordon and McClement would be an effective defensive duo, even if Colton Orr is dragging them down for his customary five minutes a night. Bozak might be the cashing in elsewhere come July, but after a long search for a number one centre, the Leafs have plenty of options. I still prefer the leafs singing Bozak at 3C money then no Bozak at all. Also why are you dissing Bozak. Connolly was a complete failure and Bozak was at least productive in his role. He is certainly over his head as a 1C. And to be fair here, Grabbo is already way over paid for his role. Grabbo is a better player then Bozak but another option is to buy out Grabbo and use money to sign Gordon as a 3C and get a cheaper 2C like Weiss. Also the treatment that faceoff are overrated is a bit too simplified in the real game. They are important on the PK and when protecting leads. They are important for clearing the zone and getting line changes. They are important if you have a defence who is continually hemmed in their own zone or ices the puck under pressure. And it also assume that any team is average team but when you clearly out matched, this nice relationship breaks down. That is the leafs need to be at least competitive here. Going with kadri, colborne and grabbo puts the leafs at a clear disadvantage. You can't get Bozak at 3C money, so if you really like Bozak you need to be willing to pay him way more than he's worth. That's the reality. Connolly didn't work out, but that doesn't mean Bozak being a 40ish point player was good production when you consider how many minutes he got (both even strength and PP), and who he played with. People slag on Grabo for not scoring, but Carlyle buried him in a defensive role this year, and he actually played pretty well in that role (I'll expand on this in a post sometime in the future). Buying him out would make the team much worse. As for faceoffs, I'm not saying winning them is without value, just that the difference between the best players in the league (at 60%) and the worst (at 40%) really isn't that big of a difference on a game-to-game basis. You're talking maybe 1-2 extra wins a game. You don't keep Bozak just because he's good at faceoffs when he's so bad at so many other things. 1. Look I don't want Bozak at 1C money but if we get him at 3C I would sign him up. I'm not sure how you feel about him as a 3C. I also reject your assertion that you can't get bozak at 3C money. This is a negotiation after all. If we can't get him let him walk what is the harm in trying. And Bozak should go for his pay day as a UFA he earned the right and he is not evil for trying. This is just like Grabbo went for his pay day last year. 2. Grabbo does face tough competition but he is still overpaid for his role and especially now that cap is falling. I'm not slagging on Grabbo for not scoring, what I'm saying we can get a cheaper player as a checking center if that is how he used. Also his salary, makes negotiations with bozak tougher. 3. Going with Colborne/Kadri/Grabbo/Mcclement will not improve usage for Grabbo or the leafs. Bringing in a capable and cheaper checking center will. Keeping Grabbo and getting a checking center is also another option. 4. I disagree on faceoffs. They are important on PK. They are also useful when you are hemmed in your own zone and the center wins the faceoff and team clear the zone and allows a line change. If they lose the faceoff, the players get tired and wear down. The goal with a facoeff here is not to get a Corsi event or shot on goal. The goal is clear the zone and get fresh men on the ice. Faceoffs are not correlated to "winning" but they are important to hockey and that study trivializes how and why they are used. Yes in term of set plays that lead to goals they are largely irrelevant. But that is not the only purpose of face offs. Bozak can go for his pay day, I'll just be happy if the Leafs aren't the ones writing the cheque. The point I'm making is that Grabo shouldn't be used as a pure checking centre. He was scoring ~50 points a season in a two-way role. The Leafs could have avoided using his as a pure checker this year if they didn't use a 4th line with face punchers. So to utilize Grabo more effectively, sign Boyd Gordon and pair him with McClement for a true shutdown, defensive line. Preferably not saddling them with orr, but maybe I'm a dreamer. Basically, faceoffs matter, but the difference between good faceoff teams and bad faceoff teams is so tiny that they aren't as important as people think.